This is turning out to be a big week in browser-land, with both the official release of IE9 and the Firefox 4 release candidate now available for your downloading satisfaction. Both include big changes to the user interface, as well as the underlying technology. (The final version of Firefox 4 is now available for download from the Firefox site.) This story looks at the release candidate of Firefox 4, but the final version will be virtually identical, save for some bug fixes. Come along as we compare these two new browsers in a few of key areas. Most major browsers now feature simplified interfaces with fewer toolbars than before, and take up less of the screen than older browsers. IE9 and Firefox 4 are no exception. Both are highly streamlined, and designed to only show the features you'll use most often. 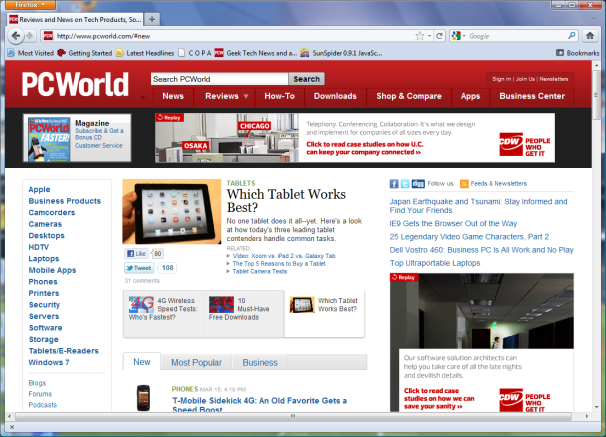 By default, IE9 places the tabs alongside the address bar. This is great if you don't have a lot of screen space (as it doesn't require another toolbar), or if you don't use many browser tabs, but if you're like me and have many tabs open at once, this setup can be quite constraining. Luckily, Microsoft does let you switch to a more conventional tabs-on-a-separate-line setup (right-click the toolbar and select "Show tabs on a separate row"). In addition, Microsoft made some changes the IE9 to reduce the number of alert messages you see. In many instances where you would have gotten an alert box in IE8 and earlier (such as when you download a file), it now shows an unobtrusive bar along the bottom of the browser window--a nice change. Firefox 4 uses an arrangement similar to that of Google Chrome in that the tabs live above the address bar. Also, Firefox retains the separate address bar and search bar (IE9 adopted an all-in-one address bar that handles search queries as well). Like other current browsers on Windows, Firefox does not show the menubar by default. Instead, the browser's main menu items live under the orange "Firefox" button in the upper-left corner of the window. (You can turn on the menubar if you like by clicking the Firefox button, going to Options, then selecting Menu Bar.) The Firefox button menu is nicely laid out, but I was a little confused at first by its location. Most new browsers have their tools menus on the far right end of the toolbar, and I was a little thrown off when the menu button wasn't there in Firefox. 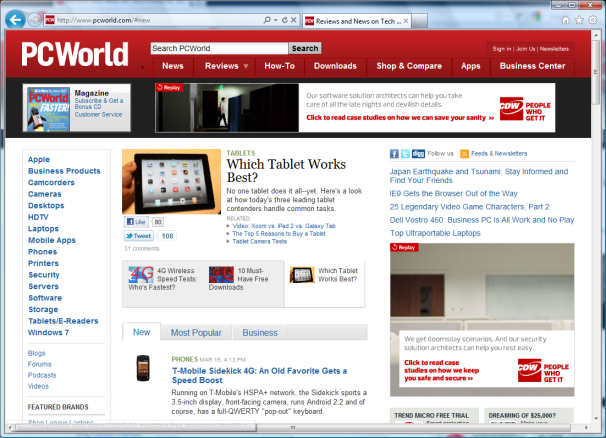 Which is better is pretty subjective in this case, and really, the two browsers are quite similar in layout and design. In my casual tests using a Core 2 Duo-based Dell Dimension desktop, Firefox 3.6.15 completed the Sunspider benchmark in 1102 milliseconds (ms) on average (shorter times are better). Firefox 4 RC, on the other hand, averaged around 363ms. IE9 edged out Firefox 4, however, averaging around 326ms (I wasn't able to test IE8 since my PC's been running IE9 since last fall's public beta). All 5 browsers I looked at (Safari, Chrome, Opera, IE9, Firefox 4) averaged between roughly 315ms and 450ms. It's hard to say one is more secure than another--after all, Firefox 4 and IE9 are brand new--but we can take a look at some of the security options that each provides. IE9's security options are largely the same as what IE8 offered, but with a couple notable changes. IE9 includes a reputation-based download scanner: If you download a file, IE9 will try to identify it based on various parameters (where you downloaded it, who produced it, etc…), and tell you whether it's safe, unsafe, or unknown. While these reputation systems aren't foolproof, it's a good additional layer of security. IE9 also lets you block sites from tracking your movements online (via a tracking cookie, for example). To get to the tracking blocker, click the gear-shaped icon in the toolbar, mouse over Safety, then select Tracking Protection from the drop-down menu. Select Your Personalized List then click the Enable button in the lower-right. IE9 can automatically block tracking, or let you choose what you want to block or allow. Microsoft also offers various Tracking Protection Lists with specific settings that you can download and select in IE9. IE9's tracking protection feature gives you a good amount of flexibility, but isn't ideal if you're looking for something you can set and forget. Firefox also features an option to prevent sites from tracking you. To get to it, click the Firefox menu, then click Options. In the Options window, click the Advanced button (a gear icon), then click the General tab. Finally, click the checkbox labeled "Tell web sites I do not want to be tracked." IE9 offers more flexibility than Firefox at preventing Websites from tracking you online, but with more flexibility comes more complexity. If you don't want to bother with tweaking settings, Firefox's one-click simplicity may be more up your alley. In either case, while these tracing protection features are welcome additions, as out Tony Bradley notes, neither Firefox 4 nor Internet Explorer 9's tracking protection are without their problems. Have you toyed around with IE9 or Firefox 4 RC? What do you think? Do you have a favorite feature? Leave a comment with your thoughts.